Fresh fruits and vegetables are some of the most healthful, versatile, and downright delicious foods on the plant. Many are best eaten raw, like apples, all types of berries, plums, peaches, pears, grapes, cherries, carrots, lettuce, mushrooms, scallions, celery, and green pepper. So naturally, you want your fresh fruits and vegetables to be clean and well-washed. If you aren't satisfied with simply washing them with water, you can buy a wash for just that purpose. But if you'd rather not spend money on that, you can make a wash yourself. Here's how to do that for a fraction of the price of store-bought wash. All you need is white vinegar, water, and a spray bottle. The method differs slightly depending on the variety of fruit or vegetable. For fruits and vegetables like apples, pears, potatoes, and carrots, fill a spray bottle with equal parts white vinegar and water and spray it onto the fruits and vegetables. Rub it in and then rinse well. For fruits and vegetables like berries, tomatoes, lettuce, and broccoli fill a bowl with equal parts white vinegar and water and soak the produce in the solution for a couple of minutes. Then rinse well. The acetic acid in the vinegar kills bacteria and helps to dissolve the wax, pesticide and fertilizer residues found on the skins of many fruits and vegetables. It'll also rid just-picked produce of any bugs that may be hanging on. Sure beats finding a slug or cabbage worm in your salad! 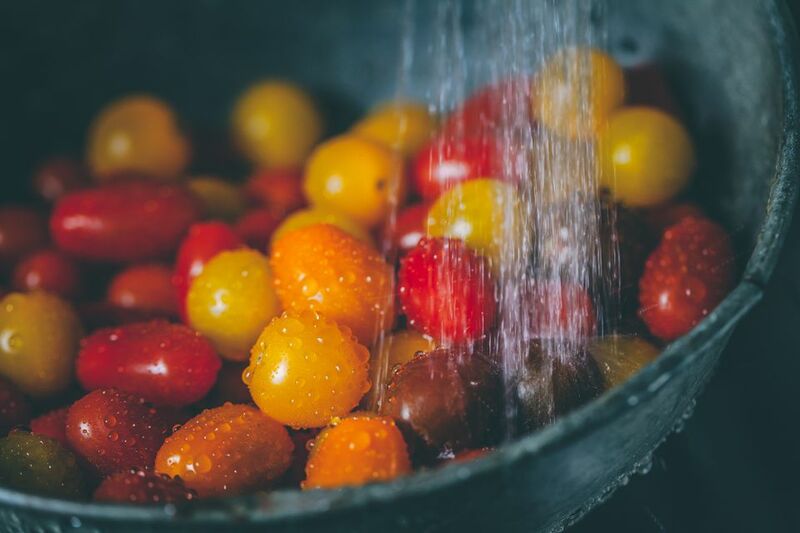 Making your own produce wash has several benefits: It's cheaper than store-bought washes, it cleans more effectively than water alone, and it's made with all-natural ingredients. Don't wash fruits and vegetables until you're ready to use them. Adding moisture in the form of a veggie wash or even plain water will cause them to go bad sooner. If the produce you bring home from the store seems to go bad before you think it should, it could be the way you're storing it. Different fruits and vegetables require different storage conditions. Some like dark, dry environments, while others prefer sun and humidity. Learn what each fruit or vegetable prefers, and you'll be well on your way to less food waste. Use a scrub brush to work the solution into the skin of hard-skinned fruits and veggies. Store your fruit and vegetable wash out of the reach of children. It isn't toxic, but it sure wouldn't taste good. And it's just best to teach kids to leave all cleaners alone. Always label the contents of your spray bottles so that everyone in your household knows what they are, and there aren't any mix-ups.